Did Putative President, Barack Obama, At the Behest of Malcolm X, His Alleged Biological Father, Live with Then-Indonesian President Sukarno When He Was a Young Boy? Martha Trowbridge has published another article on putative President, Barack Obama, whose real name she contends is Bâri′ M. Shabazz. This article is entitled, “Obama History” Mystery Buffs: Sniff Here,” and can be accessed at http://terribletruth.wordpress.com/2011/12/18/obama-history-mystery-buffs-sniff-here/. Ms. Trowbridge maintains that in 1961, when Bâri′ was just two years old, Malcolm X, Obama’s biological father, decided that it was in the best interest of little Bâri′ that he be sent off to Indonesia to be raised by Indonesian President, Sukarno. She adds that while the decision was painful for her to make, Jo Ann Newman, Bâri′’s biological mother, agreed for the sake of honoring Malcolm X’s wish that becoming part of Sukarno’s family was the best thing for her son, Bâri′. Ms. Trowbridge explains why Malcolm X would have picked Sukarno to be a surrogate father to his son. Malcolm X idolized Sukarno, having a deep respect and admiration for the first President of Indonesia, a socialist revolutionary who rid Indonesia of its white Dutch oppressors. He could also offer Bâri′ things that he would not get back home living in East Elmhurst, NY with his mother, Jo Ann Newman. Some of those benefits included gaining a stand-in father, living in a presidential palace, good education, Moslem religious instruction, learning the local language and leadership skills, and living in a nation free from the racism of America. Sending little Bâri′ off to Indonesia also served Malcolm’s need to hide from the world that he, a black Moslem minister who preached hatred for whites, fathered a child with a white woman. She lays out what Sukarno’s political, social, and economic policies were and concludes that Obama’s are not that much different today. These policies included, among other things, “guided democracy,” nationalization of major industries, and constituting a civilian army for the nation. Ms. Trowbridge explains how Sukarno started losing power in October 1965 and that Army Major General Suharto eventually replaced him on March 12, 1967, becoming the new president. Bâri′ was 6 years old in 1965. The question then is what happened to Bâri′? How and when did he make his way back to the United States? Where did he go? Did he really arrive in Hawaii? When did he arrive? With whom did he live? Why has Obama told us that he lived in Indonesia from age 6 to 10 when it looks like it was probably age 2 to 6? I hope that Ms. Trowbridge will provide answers to these and other questions in her future articles. I read with interest the story published on December 10, 2011 at WND entitled, “4th-graders brainwashed with Occupy 'propaganda'-Student's dad complains to Scholastic News publisher." The 4th grade child’s father, who I will call “father Edward,” complained to Scholastic because in his view the publisher only provided one side of the “Occupy Wall Street” debate, only putting forth the view that those who are protesting are innocent victims of American society’s oppression but not reporting the conduct of those protesters and who is politically behind those protesters. Read more: 4th-graders brainwashed with Occupy 'propaganda' http://www.wnd.com/?pageId=376177#ixzz1gFmocVmk. One probably would then say why would I write about that and how does the title to his article really all stay together. Well, let us take a look at how such events are really part of a much bigger picture and why I used the title that I did. Emer de Vattel, gave us a time-honored definition of a “natural born Citizen” which the Founders and Framers used when drafting the Constitution. That definition is a child “born in the country, of parents who are citizens.” Emer de Vattel, The Law of Nations, Section 212-231 (London 1797) (1st ed. Neuchatel 1758). Accepting natural law and the law of nations of which Vattel wrote and reported, the Founders and Framers gave the critical task of being President and Commander in Chief only to future “natural born Citizens.” These were to be the children born in the United States to parents who were born or naturalized Citizens of the United States. (2) Inglis v. Sailors’ Snug Harbor, 28 U.S. 99, 3 Pet. 99, 7 L.Ed. 617 (1830): The majority cited Vattel on the right of election to change one’s allegiance and thus citizenship in the context of the new nation being formed after revolution. The Court found on principles consistent with Vattel’s jus sanguinis and not on the English common law rule of jus soli, that simply being born in New York, after July 4, 1776 and before September 15, 1776, when the British took possession of New York, was not sufficient to establish one’s status as an American citizen, for a child of minor years is incapacitated from making any citizenship election but rather followed the citizenship held or chosen by the father. On the contrary, relying upon principles of the English common law, Justice Johnson and Justice Story, who wrote separate minority concurring opinions, would have found the child born in New York during the same time period a citizen of the State of New York, regardless of the citizenship of his parents. Id. 136 and 164. This case shows what the majority rule was on citizenship and that it followed the Vattelian doctrine that a child when born took on the national character of his or her father (meaning father and mother under the doctrine of merger of the wife’s citizenship into the husband) and did not acquire his or her citizenship from the territory in which he or she was born. “The Constitution does not in words say who shall be natural-born citizens. Resort must be had elsewhere to ascertain that. At common-law, with the nomenclature of which the framers of the Constitution were familiar, it was never doubted that all children born in a country of parents who were its citizens became themselves, upon their birth, citizens also. These were natives or natural-born citizens, as distinguished from aliens or foreigners. Some authorities go further and include as citizens children born within the jurisdiction without reference to the citizenship of their parents. As to this class there have been doubts, but never as to the first. For the purposes of this case, it is not necessary to solve these doubts. It is sufficient, for everything we have now to consider, that all children, born of citizen parents within the jurisdiction, are themselves citizens.” Id., at 167-68. "It seems to me to result of necessity from these principles, that the children of English parents, though born abroad, are nevertheless regarded by the common law as natural born citizens of England. The decision upon the plea in Calvin's case, which was merely repeating what was decided in Cobbledike's case, as early as the reign of Edw. I, see Calvin's case, p. 9 b., necessarily implies that a child may owe allegiance to the king (i.e., not merely local or temporary, but natural and permanent allegiance), although born out of the king's dominions; and also that this was a broad general rule, not confined to a few exceptional cases, because if this was an exception the plea could not have been held bad on demurrer, as it was in both Cobbledike's and Calvin s cases; but the exception must have been pleaded. Now, upon what ground can allegiances in such cases be claimed ? If natural allegiance or allegiance by birth, does not depend upon boundaries or place, as Calvin's case asserts, upon what does it depend? There can be but one answer to the question. It is impossible to suggest any other ground for the obligation than that of parentage. It must, I apprehend, be transmitted from the parents to the child, or it could not exist. This being then the nature of permanent allegiance, it follows that the king of England may properly claim allegiance from the children of his subjects, wherever born. If then the child of English parents, though born abroad, is subditus natus a born subject of the king, he must also be a born citizen of the kingdom. Allegiance and citizenship are as we have seen, correlative terms, the one being the consideration of the other. So long therefore as the parents continue to owe allegiance to the crown of England, so long will their children, by the rules of the common law, whether born within or without the kingdom, owe similar allegiance, and be entitled to the corresponding rights of citizenship. I suppose the doctrine that children, if legitimate, follow in regard to their political rights and duties, the condition of their fathers, to be found in natural law, and to be substantially the same in most, if not all, civilized countries. Vattel says: " Society not being able to subsist and perpetuate itself, but by the children of its citizens, those children naturally follow the condition of their fathers and succeed to all their rights." B. 1, ch. 19, § 212. In a subsequent action the same author says: " It is asked whether the children born of citizens in a foreign country are citizens, the laws have decided this question in several countries, and it is necessary to follow their regulations. By the. law of nature alone, children follow the condition of their fathers, and enter into all their rights. The place of birth produces no change in this particular, and cannot of itself furnish any reason for taking from a child what nature has given him. I say of itself, for the civil law, or politics, may order otherwise from particular views. Id., § 215. Minor, clearly stating what the firmly established American common law rule (not the British common law rule) was by which the Founders and Framers were guided, had no doubts about who a "natural-born citizen" was, defining one as a child born in the country to citizen parents. Minor said that under that same American common law rule there were doubts as to whether a child born in the United States to alien parents is even a "citizen." Wong Kim Ark resolved those doubts and held that Wong, who was born in the United States to domiciled alien parents, was a Fourteenth Amendment "born . . . citizen of the United States." But in so doing, it did not alter or amend the original and long-standing American common law rule of what a “natural born Citizen” was and therefore did not hold that Wong was an Article II "natural born Citizen." There is no other U.S. Supreme Court case following Wong Kim Ark which changed the Minor original American common law definition of a "natural-born citizen." We have seen that Vattel informed us what a “natural born Citizen” is and, as our U.S. Supreme Court and some lower courts have confirmed throughout the span of American history, our Founders and Framers, when drafting the presidential eligibility requirements included in Article II, Section 1, Clause 5, adopted that definition. But there is another important message in what Vattel wrote which is really the basis for the Founders and Framers choosing Vattel’s definition of a “natural born Citizen.” Vattel also warned us that we cannot preserve our society but through the children of its citizens. Vattel said in Section 212 The Law of Nations that a society cannot fundamentally preserve itself other than through the children of its citizens who he calls the “natives, or natural-born citizens.” Vattel told us that it is the youth of any society that will eventually, upon reaching the age of majority (then it was 21 and today it is 18), assume the power to administer and preserve that society. Vattel was perfectly correct in what he said and Adolf Hitler knew it also. 'He alone, who owns the youth, gains the Future! Practical consequences of this doctrine: The boy will enter the Jungvolk (boy 10-14) and the Pmpf (members of the Jungvolk) will come to the Hitler Youth, and the boy of the Hitler Youth will join the SA, the SS and the other formations, and the SA man and the SS man will one day join the Labor Service, and from there he will go to the Armed Forces, and the soldiers of the people will return again to the organization of Movement, the Party, the SA, the SS, and never again will our people be so depraved as they were at one time.' (2656-PS; 2401-PS). " Hitler knew that it was not going to be easy for him to win the hearts of all Germans. “He realized that he would never be able to convert all Germans to National Socialism. He converted many, but many others saw through the official propaganda. The younger generation was a different matter. They came to the Hitler Youth as more of a clean slate which were much more vulnerable to ideological manipulation. He was skeptical about the schools, especially the schools he inherited in 1933. The Hitler Youth was a program that the NAZIs could completely control. Not only did the Hitler Youth provide the vehicle which the future generation of Germans could be shaped, but the youth could be used in many other ways by Hitler and the NAZIs.” http://histclo.com/youth/youth/org/nat/hitler/hitler.htm. From what Vattel teaches, we can see that allegiances and values are nurtured in the family. And Hitler knew that, too. He also knew that “Youth is easily deceived, because it is quick to hope.”—Aristotle. The First Hitler Youth Law proclaimed: "The future of the German people depends on its youth. Therefore, all of the German youth must be prepared for its future duties." Two subsequent Hitler Youth Laws were designed mostly to prevent families from evading the requirement to enroll their children in the HJ. http://histclo.com/youth/youth/org/nat/hitler/hitler.htm. In studying the Hitler Youth, we find that “[f]amily attitudes are especially interesting because part of the purpose of the HJ [Hitler Jugend] was to break down family allegiances and cement loyalty to the Party and Führer.” “The boys were encouraged to question or even reject some authority figures, such as parents or church leaders, which appealed to many boys. They were required, however, to accept NAZI principles without question.” http://histclo.com/youth/youth/org/nat/hitler/hitler.htm. It also does not take much time to fundamentally transform a nation’s youth. NAZI youth organization began in 1922. The NAZIs seized power in 1933. Independent youth groups were absorbed into the Hitler Youth or abolished. The NAZIs by 1935 had enrolled 60 percent of Germany's youth into their youth movement. http://histclo.com/youth/youth/org/nat/hitler/hitler.htm. The Hitler Youth consisted of two sections, the Deutsche Jugend for the younger (10-14) boys and the Hitler Jugend proper for the older (15-18) boys. “The Hitler Youth grew from a group with a handful of boys to one of the most important uniformed youth group in Europe. No group so thoroughly succeeded in their stated purpose. Had the NAZIs succeeded, the elite of Europe would have been raised and trained through the Hitler Youth. Membership increased from about 1,000 boys in 1923 to nearly 8 million in 1939 when Hitler launched World War II.” http://histclo.com/youth/youth/org/nat/hitler/hitler.htm. Arthur Axmann, a Hitler Youth Leader, presented Hitler with a newly formed division--the 12th SS Panzer Division Hitlerjugend--on his birthday in April 1944. The Division was composed of HJ youth born in 1926, making them 17-18 years old. The senior NCOs and officers were mostly SS veterans from the Eastern Front. This Division played a prominent role in the Normandy fighting. How does any of this relate to America? The message that we should learn is that we should not take so lightly the Occupy Wall Street, text messaging, text+, iPhones, YouTube, Facebook, Twitter, Tumblr, Droid, etc. movements and networks, especially if someone attempts to use those channels of education and communication to influence and manipulate American youth the way Hitler did German youth. While Scholastic states on its web site that it is committed to publishing all information for the sake of preserving a free society (see the WND article) and it has perceived that there is an important need to “educate” our children about the “Occupy Wall Street” movement, I have not seen one word in its publications about the ongoing national debate about whether President Obama is an Article II “natural born Citizen.” Omission of the “natural born Citizen” issue from its publications, but inclusion therein of the “Occupy Wall Street” movement, should surely raise grave suspicions on the part of any sound thinking concerned American. What our nation’s youth learns through any medium is, indeed, vital to the survival of our nation as we known it. Therefore, let us be, as father Edward is, forever vigilant about what someone is trying to teach our children, no matter what that subject or the professed motivation for teaching that subject might be. Is Putative President Barack Obama’s Mother, Stanley Ann Dunham, Really Jo Ann Newman? Martha Trowbridge reports that she has uncovered the true identity of Stanley Ann Dunham, putative President Barack Obama’s mother. She writes in her latest article, Stan The Sham, and True Love, posted at her blog, Terrible Truth, on November 15, 2011, at http://terribletruth.wordpress.com/2011/11/15/stan-the-sham-and-true-love/ that Dunham’s real name is Jo Ann Newman. Why would Obama tell us that his mother’s name is Stanley Ann Dunham when it is really Jo Ann Newman, a white teenage girl from the Bronx, New York, who according to Ms. Trowbridge was Malcolm X’s teenage lover and devotee? Is Obama telling us a lie about his mother’s true name because he wants to hide his own real identity? Is he telling us that lie because he wanted to make himself more electable to the average American? What would knowing that Obama’s mother’s real name is Jo Ann Newman tell us about Obama’s true identity? And why would Obama want to hide his true identity? 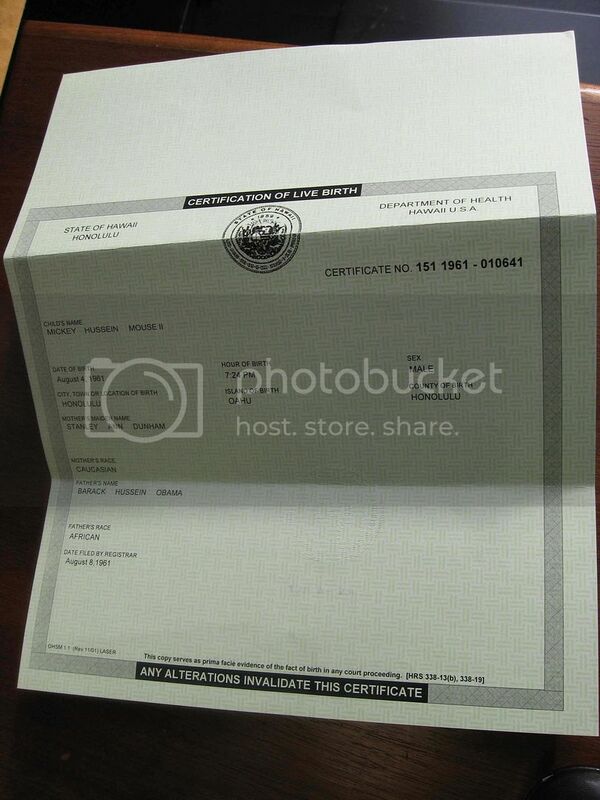 I have already reported at this blog in numerous posts and comments that various experts have concluded that Obama’s long-form birth certificate which he posted on the internet in April 2011, is a forgery. I have also reported that Obama is using a questionable social security number issued from Connecticut and that evidence shows that he forged his Selective Service Registration application. I have already reported at this blog that Ms. Trowbridge maintains that most of the pictures of Obama and his mother that the American public has been fed by Obama and his campaign have been photo shopped so as to conceal the real face of Obama’s mother. These pictures were done, among other reasons, to give Stanley Ann Dunham the appearance of having long hair when in fact she had short hair. Other facial features were also digitally changed in these photographs. So now we discover that not only has this person’s hair and face been altered but also her name. Many of Obama’s other publicly-released photographs also reveal signs of tampering and forgery. Ms. Trowbridge also contends that Obama’s real name is Bâri′ M. Shabazz, born in New York City, on October 28, 1959, who was assigned social security number 084-54-5926, issued in New York, in 1974. See my article entitled, Is Barack Hussein Obama II Really Bâri′ M. Shabazz, Born October 28, 1959 in New York City? , at http://puzo1.blogspot.com/2011/11/is-barack-hussein-obama-ii-really-bari.html. I also reported at this blog that the Bari Shabazz, who had an auto accident in Honolulu County, Hawaii on March 12, 1982, could be the same Bâri′ M. Shabazz and Barack Obama. See my article entitled, Is Putative President Barack Hussein Obama II Really Bari Shabazz, Fugitive from Justice For 21 Years Following An Auto Accident in Honolulu County, Hawaii on March 12, 1982? , at http://puzo1.blogspot.com/2011/11/is-putative-president-barack-hussein.html. What we now add to our puzzle is Stanley Ann Dunham’s real identity which Ms. Trowbridge says is Jo Ann Newman. So, who is Jo Ann Newman? Did she and her family and friends know Malcolm X? The big question now is how we reconcile the name of Jo Ann Newman with the Stanley Ann Dunham life story that we have been provided. As we know, this alleged fabricated life story consists of, among many life events, a birth in Kansas; youthful years and schooling in Washington; schooling in Hawaii; a hasty marriage to and divorce from Barack Obama Sr.; a marriage to and divorce from Lolo Soetoro; a move to Indonesia; and the birth of Maya Soetoro in Indonesia. The American public has been informed through numerous publicly-released documents and from Obama himself that Obama’s legal father is Barack Obama Sr. Hence, in the case of Kerchner v. Obama, 669 F.Supp.2d 477 (D.N.J. 2009), which I filed on January 20, 2009, before Obama was sworn into office, we maintained that Obama, does not meet the original and still-prevailing American common law definition of a “natural born Citizen’ which is a child born in the country to citizen parents. I cited and quoted, among many other sources, Emer de Vattel, The Law of Nations, Or, Principles of the Law of Nature (London 1797) (1st ed. Neuchatel 1758) (“The native, or natural-born citizens, are those born in the country, of parents who are citizens;); Minor v. Happersett, 88 U.S. (21 Wall.) 162, 167-68 (1875) (“At common-law, with the nomenclature of which the framers of the Constitution were familiar, it was never doubted that all children born in a country of parents who were its citizens became themselves, upon their birth, citizens also. These were natives or natural-born citizens, as distinguished from aliens or foreigners”). We showed that because Obama was born to the marriage of Barack Obama Sr. and Stanley Ann Dunham, and that Barack Obama Sr. was a British citizen at the time of Obama’s birth in 1961, regardless of where that may be, he is not and cannot be an Article II “natural born Citizen” and therefore he is not eligible to be President. We also maintained that Obama has yet to conclusively prove that he was born in Hawaii or any other place in the United States and for that reason also he has not shown himself to be a “natural born Citizen.” We also sued Congress for breaching its constitutional duty under the Twentieth Amendment, despite the many petitions to do so, to properly vet Obama under Article II, Section 1, Clause 5 before confirming him as President. The New Jersey Federal District Court concluded that the plaintiffs did not have standing, i.e., that they did not show that they were personally injured in any way that is different from how all Americans would be injured living under an illegitimate and usurper President and Commander in Chief of the Military, and so it dismissed the case. 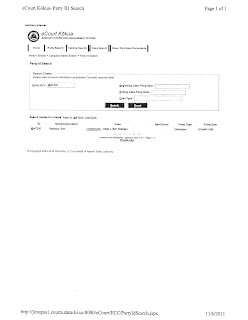 The Third Circuit Court of Appeals agreed that the plaintiffs did not show that they suffered any personal injury that was different from that of all other Americans, and even issued an order ordering me to show cause why I should not have to pay for the government’s costs in defending Obama in his eligibility law suit. Kerchner v. Obama, 612 F.3d 204 (3rd. Cir. 2010). The Court quickly discharged it order when I responded that in all the cases filed against Obama and others, Obama not once produced as evidence in court a certified copy of his long-form birth certificate. I argued that I was therefore entitled to see Obama’s long-form birth certificate to prove that the government did not mitigate its defense costs by simply producing the document to a court or Congress and thereby proving or disproving that he was a “natural born Citizen.” Our United States Supreme Court, not giving any reason for its decision, refused to hear the appeal and so the Kerchner case came to an end in the courts of the United States. The U.S. Supreme Court denial of the petition for a writ of certiorari is reported at Kerchner v. Obama, 131 S.Ct. 663 (2010). But as we can see from this court activity, the courts did not rule on the merits of whether Obama is an Article II “natural born Citizen” or whether he was born in Hawaii. Regardless of whether Obama’s biological father is Malcolm X (a “citizen of the United States”), Obama’s legal father is Barack Obama Sr. and it will stay that way regardless of what Obama might attempt to do to change that. Obama is therefore not a “natural born Citizen” and not eligible to be President. But let us stay tuned for more to come from Martha Trowbridge. Is Putative President Barack Hussein Obama II Really Bari Shabazz, Fugitive from Justice For 21 Years Following An Auto Accident in Honolulu County, Hawaii on March 12, 1982? http://puzo1.blogspot.com/2011/11/is-barack-hussein-obama-ii-really-bari.html. The basis of the question that I asked came from a November 2, 2011 breaking story published by Martha Trowbridge entitled, “Bâri′, Barry, Barack, accessed at http://terribletruth.wordpress.com/2011/11/02/bari%e2%80%b2-barry-barack/. In her article, Ms. Trowbridge’s contends that putative President Barack Hussein Obama II’s real name is Bâri′ M. Shabazz and that his date of birth is October 28, 1959, and his social security number is 084-54-5926. She says he was born in New York City. She adds that he was born with the name Bâri′ M. Shabazz. She also says that to be able to enter the political world, Bâri′ M. Shabazz had to change his birth identity and take on a new one which became Barack Hussein Obama II. Ms. Trowbridge has found that the Social Security Death Index shows: “SHABAZZ, B M 28 Oct 1959 Aug 1994 (V) 34 (PE) (none specified) New York 084-54-5926.” From this, one would think that Bâri′ died in August 1994. 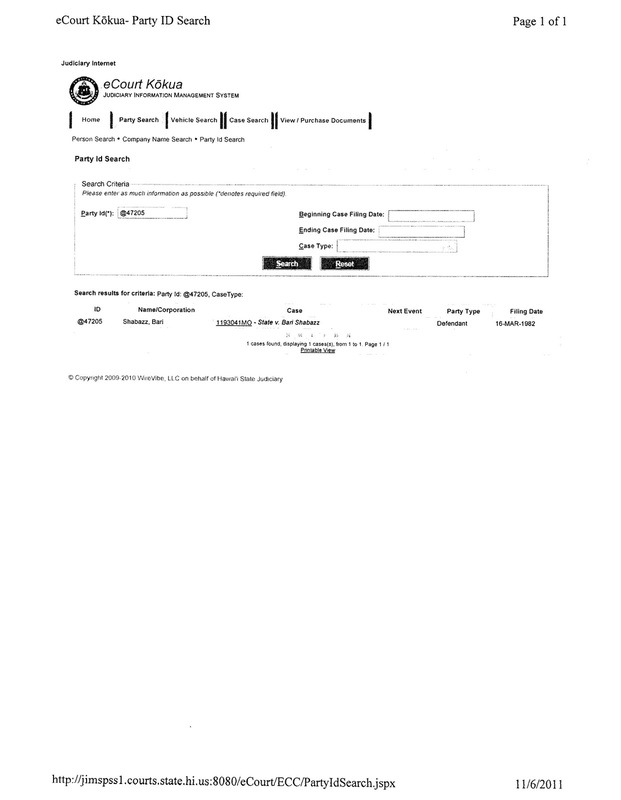 But no, Ms. Trowbridge informs that only his identity was made “dead.” The real person continued to live and that person became “Barack Hussein Obama II.” Note how she explains that the “death” of Bâri′ was only reported by someone (“V” or “Verified”) and that the person did not present any valid death certificate (“P” or “Proof). Finally, and the most shocking part of her report is that Ms. Trowbridge contends that Bâri′ M. Shabazz is the biological son of Malcolm X. Hence, if Barack Hussein Obama II is the same person as Bâri′ M. Shabazz, that would make putative President Obama the biological son of Malcolm X. On November 4, 2011, an anonymous source emailed me something very interesting. 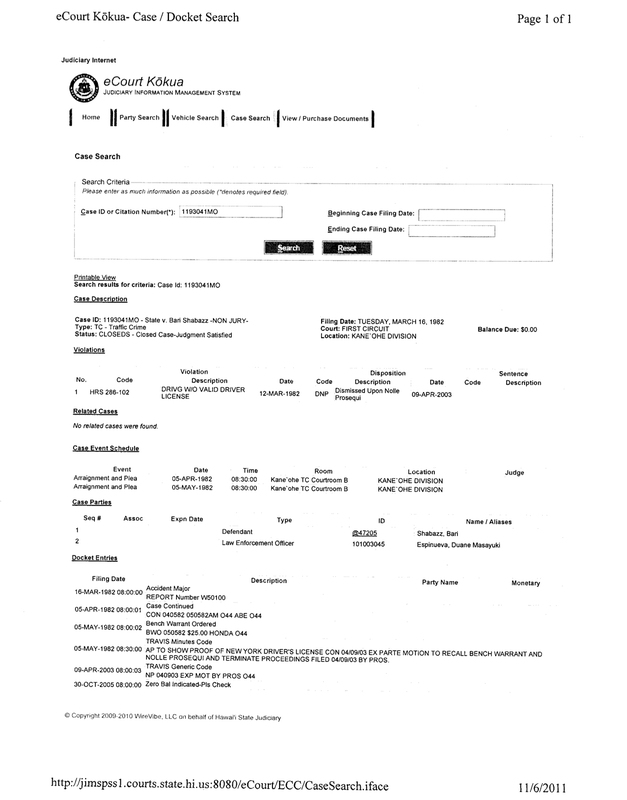 To substantiate the content of the email, the writer directed me to go to a web site of the Judiciary for the State of Hawaii and to do a search of cases that have been disposed of by that State’s traffic courts. The anonymous source had done just that and so the person provided me with the information which that traffic court shows on its web site.
. The case was continued to April 5, 1982. The record also shows that Bari Shabazz was supposed to be arraigned and enter a plea on April 5, 1982, at 8:30 a.m., in Kane’ohe Traffic Court, Courtroom B, at the Kane’ohe Division. The case was continued to May 5, 1982. The report then shows that the prosecutor on April 9, 2003, filed an ex parte motion to recall the bench warrant and announced on the record “nolle prosequi.” This is a Latin phrase which is formally entered into a court record which means that the prosecutor in a criminal case “will no further prosecute” the case. The motion was listed as “NP [nolle prosequi] 040903.” So, the charge was dismissed upon the prosecutor’s ex parte “Nolle Prosequi” motion made on April 9, 2003. “Ex parte” means that only one side made the application which in this case was the prosecutor. 1. 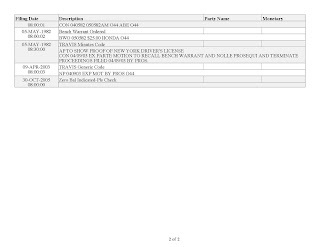 Is the Bari Shabazz named in this traffic court report the same person Ms. Trowbridge calls “Bâri′ M. Shabazz” in her report and who is listed as “B M Shabazz” in the Social Security Death Index? If it is the same person, then that puts New Yorker Bâri′ M. Shabazz in Honolulu County, Hawaii, on March 12, 1982. Using a date of birth of October 28, 1959, this would have made Bâri′ M. Shabazz 22 years old at the time that he had this major automobile accident in Honolulu County. 2. The accident is characterized as a major accident. Chances are that Bari Shabazz and/or any passenger was taken to a local hospital in Honolulu County due to his/their injuries. If Bari Shabazz suffered any major injuries or laceration, the physical signs of those injuries and/or lacerations could still be present somewhere on his body if he is still alive. 3. Bari Shabazz was charged with driving without a driver’s license. The court ordered him to show proof of his New York driver’s license. Hence, Bari Shabazz must have told the charging police officer or the court that he did have a driver’s license and that it was one issued by the State of New York. Hence, Bari Shabazz must have been a resident of the State of New York. Note that Ms. Trowbridge said that Bâri′ M. Shabazz was born in New York City. 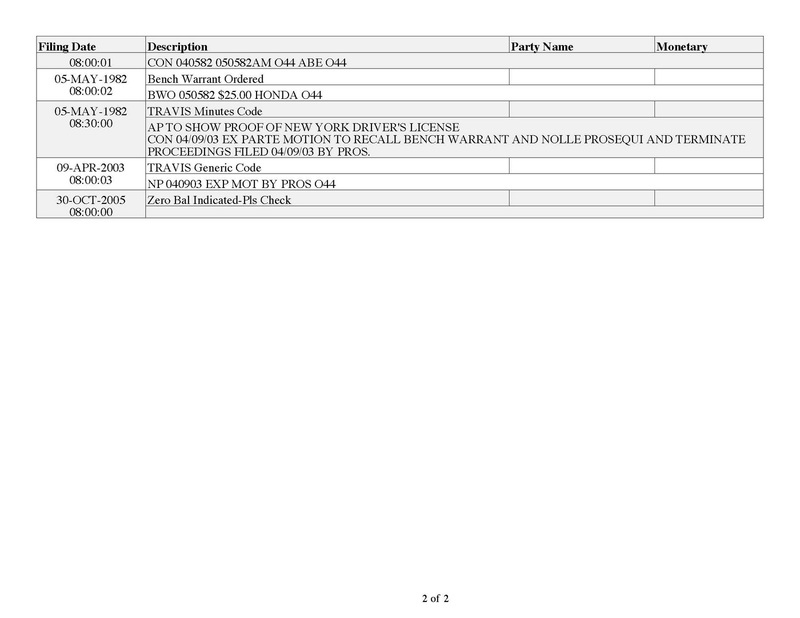 Also, what was Bari Shabazz doing driving in Hawaii with what should have been a New York driver’s license? Was he now living in Hawaii? Was he there on vacation? Was he there visiting family or friends? Was he going to school there? 4. On April 9, 2003, the prosecutor filed a motion to recall the bench warrant, to terminate prosecution, and close the case. Why would this case come to the attention of some local prosecutor 21 years following the initial violation of March 12, 1982? A local prosecutor does not just go looking for cases that are 21 years old and file motions to dismiss those cases. Someone must have asked that local prosecutor to dismiss the case so that the arrest warrant was cleared from the court’s and nation’s computer system. 5. Ms. Trowbridge shows that Bâri′ M. Shabazz, according to the Social Security Death Index, died in August 1994. 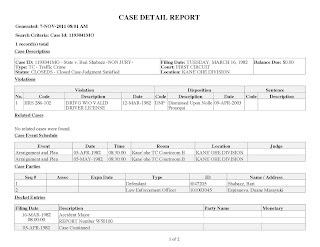 If Bâri′ M. Shabazz is the same person as is listed in this Hawaii auto accident as Bari Shabazz, why would someone care to recall his arrest warrant on April 9, 2003 or almost 9 years after his death? Surely, it could not be Bâri′ M. Shabazz who was interested since he had been dead since 1994. On the other hand, if he was not dead he would be interested. 6. On October 30, 2005, or 23 years following the date of the accident of March 12, 1982, the court again re-visits the case of Bari Shabazz, noting that he did not owe the court any money but to “Pls. check.” Why would the court again concern itself with this case on that date, especially if Bari Shabazz was dead since 1994? 7. So, is the Bari Shabazz named in this Hawaii traffic court report the same person Ms. Trowbridge calls “Bâri′ M. Shabazz” in her report and who is listed as “B M Shabazz” in the Social Security Death Index? That question surely merits an investigation. If he is, then that puts the New-York-born Bâri′ M. Shabazz in Honolulu County, Hawaii, the alleged birth place and once place of residence of putative President, Barack Hussein Obama II. Given what Ms. Trowbridge has concluded in her report, that is a circumstantial piece of evidence that is surely worth investigating. What also supports Ms. Trowbridge’s position that Bâri′ M. Shabazz really did not die in August 1994 and that he is still alive as Barack Hussein Obama II is that the traffic court in Hawaii was still acting on the Bari Shabazz traffic case 9 and 11 years after the alleged death in August 1994 of Bâri′ M. Shabazz. What needs to be investigated is why the local prosecutor and court took those actions so many years after the traffic accident and at whose behest. 8. Finally, when there is an auto accident, the police do a detailed accident report. That report includes the name, addresses, date of birth, and social security number of the person involved in the accident who is charged for that accident. The driver’s license number is also included if that license is produced or otherwise verified. A physical description of the defendant is also included. The make of auto, including the year made and VIN number are also included, along with statements of witnesses. 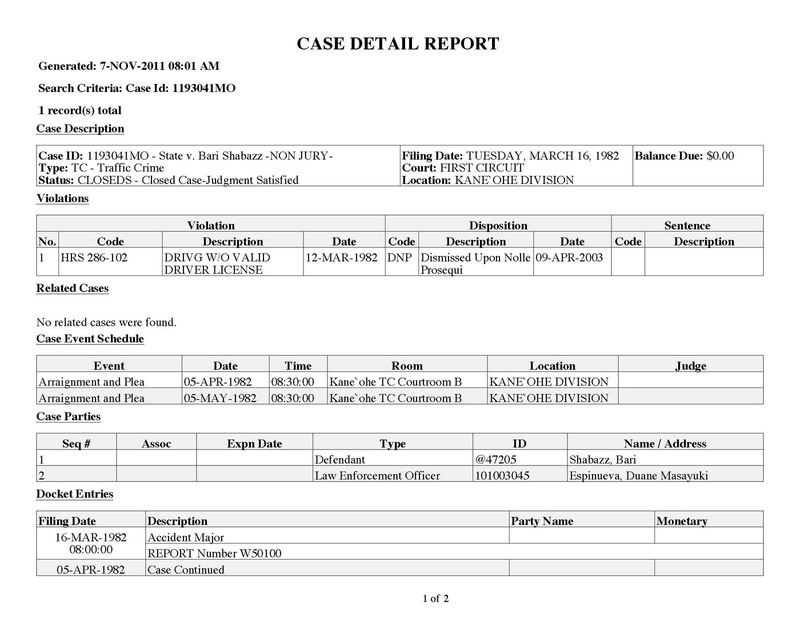 There could be a photograph of the defendant in the police record. A thorough investigation of this matter would surely include searching the police record in Honolulu County for this report so that this information may be examined and evaluated. Is Barack Hussein Obama II Really Bâri′ M. Shabazz, Born October 28, 1959 in New York City? Is Barack Hussein Obama II, a/k/a Barack Obama Jr., really Bâri′ M. Shabazz? See the breaking story, entitled, Bâri′, Barry, Barack, by Martha Trowbridge, at http://terribletruth.wordpress.com/2011/11/02/bari%e2%80%b2-barry-barack/. In her article, Ms. Trowbridge contends that putative President Obama’s real name is Bâri′ M. Shabazz. She also tells us that this past Friday, October 28, 2011, was Bâri′’s birthday. She says that the person who presents himself as Barack Hussein Obama II was born on October 28, 1959, in New York City. She adds that he was born with the name Bâri′ M. Shabazz. What is also really interesting is that according to Ms. Trowbridge, the names Bâri′, Malik, and Shabazz are “sacred to Malcolm X.” Go to Ms. Trowbridge’s story to see what these names mean. Ms. Trowbridge says that Bâri′ discovered that he was the son of Malcolm X. He then wanted to complete what his father had started in the political world. But he realized that he could not do it if the world knew that he was the illegitimate son of Malcolm X, a Muslim revolutionary. Hence, he had to change his birth identity and take on a new one. She also explains that “father” Barack Obama was Malcolm X’s Kenyan friend. Here is more amazing information: Ms. Trowbridge has found that the Social Security Death Index shows: “SHABAZZ, B M 28 Oct 1959 Aug 1994 (V) 34 (PE) (none specified) New York 084-54-5926.” From this, one would think that Bari died in August 1994. 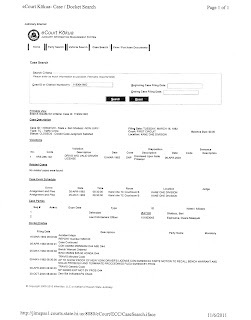 But no, Ms. Trowbridge informs that only his identity was made “dead.” The real person continued to live and that person became “Barack Hussein Obama II.” Note how she explains that the “death” of Bari was only reported by someone (“V” or “Verified”) and that the person did not present any valid death certificate (“P” or “Proof). Finally, do note Ms. Trowbridge also shows how close Bâri′ and Malcolm X lived together in East Elmhurst, New York. What Ms. Trowbridge has presented to the world is surely shocking (an understatement). What she says surely needs to be investigated as soon as possible. Hopefully our political, legal, and police institutions will be up to the task. So far, they have not been. You have got to love Obama’s enablers. They have a web site called, “A Place to Get the REALLY Right Answers About Natural Born Citizenship,” accessed at http://birtherthinktank.wordpress.com/a-place-to-get-the-really-right-answers-about-natural-born-citizenship/. 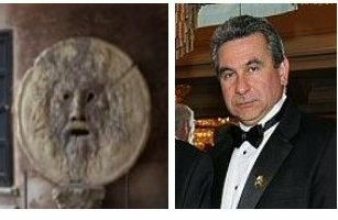 Clearly, the title of this web site refers this web site, “Natural Born Citizen - A Place to Ask Questions and Get the Right Answers,” accessed at http://puzo1.blogspot.com/ , which I created in December 2008. New Evidence Regarding Obama's Alleged Father: Is it Malcolm X? New Evidence Regarding Obama’s Alleged Father: Is It Malcolm X? See this new blog called, Terrible Truth. The owners of the new blog are writers and researchers, Martha Trowbridge and Erik Rush. They have just written an article entitled, Saps, Stool Pigeons And Stanley Ann’s Hair, accessed at http://terribletruth.wordpress.com/. The authors maintain, based on evidence of tampering with photographs of Obama’s mother, that "Obama’s Mother And Son photo was falsified to deceive us." One might ask why would Obama care to alter photos of his mother. The authors say this: “Here’s why: Obama was worried you’d find her in places, at key strategic times, with people he couldn’t let you know about. People like Malcolm X. Times like the early and mid-1960′s. Places like New York City.” Based on photo and film footage analysis, they specifically place who they say is Stanley Ann Dunham at the funeral of Malcom X. They continue: “So it just may be that Barack Obama’s father isn’t Barack Obama “Sr”, after all.” The authors conclude that Stanley Ann Dunham had Obama with Malcolm X, her secret lover. Hence, Obama’s father is Malcolm X. Please review the photos, film footage, and other materials presented by Ms. Trowbridge and Mr. Rush. I just read an article regarding a debate going on in Liberia about Presidential and Vice-Presidential eligibility requirements. The issue is whether the residency has to be immediately before the election. The article may be read at http://allafrica.com/stories/201109200851.html. The President or Vice-President eligibility requirements in Liberia are: (1) being a natural born citizen 35 years or more, (2) 10 years residence in Liberia 10 years prior to elections; (3) owner of unencumbered real property worth not less than 25,000; and (4) President and Vice-President must not come from the same county. Note that the Liberian Constitution even considers those acquiring the status of "citizen" after birth as "natural born citizens." What struck me as interesting is that they treat their "natural born citizens" like the Founders and Framers treated plain "Citizens" of the United States (distinguished from "natural born" Citizens of the United States). What is also interesting is that Liberia considers a person to be a "natural born citizen" even if that status was not acquired at birth. Indeed, they have created a contradiction and oxymoron right in their own Constitution. I suspect that Liberia is treating a "natural born citizen" just like the British treated their "natural born subject." For the British, who followed the feudal and monarchial system of subjectship with allegiance to a sovereign King rather than a true republican system with voluntary membership and allegiance to the sovereign nation and its people through free choice made by a child’s parents who then pass that decision to their children, it did not matter if one was truly a "natural born subject" or even a naturalized subject, for they considered all their subjects to be "natural born subjects," which conveniently for the King carried with it allegiance to the King for life. The Founders and Framers did not adopt the same oppressive system for the constitutional republic. They rejected that a person was born into the allegiance of a King or any nation for life. They also rejected that one could be born with allegiance to more than one nation or later in life maintain multiple allegiance at the same time. Throughout the Constitution, they were careful to distinguish between a "natural born" Citizen of the United States and a "Citizen" of the United States. In their eyes, a “natural born” Citizen was born with sole and absolute allegiance and jurisdiction to the United States and its people. They gave Congress the power to add additional members to the new republic through naturalization, which could be granted to a person only if he or she swore or affirmed to have the same sole and absolute allegiance to the United States which a “natural born” Citizen acquired by nature at birth. So for the Founders and Framers, all the “citizens” of the republic, either by birth or naturalization, had sole and undivided allegiance and jurisdiction to the United States. Through this process, people could make a decision based on free will whether they first and then through them their children wanted to become members of the republic. The Constitution gave Congress the power to make uniform the naturalization laws. Congress first exercised that power in 1790. The act of March 26, 1790, 1 Stat. 103, c. 3, provided for the naturalization of aliens and then provided that "the children of such persons so naturalized, dwelling within the United States, being under the age of twenty-one years at the time of such naturalization, shall also be considered as citizens of the United States." The third section of the act of January 29, 1795, 1 Stat. 414, 415, c. 20, provided "that the children of persons duly naturalized, dwelling within the United States, and being under the age of twenty-one years, at the time of such naturalization, and the children of citizens of the United States, born out of the limits and jurisdiction of the United States, shall be considered as citizens of the United States," etc. The fourth section of the act of April 14, 1802, 2 Stat. 153, 155, c. 28, carried into the Revised Statutes as section 2172, was: "That the children of persons duly naturalized under any of the laws of the United States, or who, previous to the passing of any law on that subject, by the government of the United States, may have become citizens of any one of the said States, under the laws thereof, being under the age of twenty-one years, at the time of their parents being so naturalized or admitted to the rights of citizenship, shall, if dwelling in the United States, be considered as citizens of the United States." The provision that children born in the United States to alien parents was carried in all of the following naturalization acts, including that of 1804, 1855, and the Civil Rights Act of 1866 which required that the child be born in the United States and not be “subject to any foreign power.” Given the world-recognized doctrine of jus sanguinis (also utilized by our own Congress in 1790 to make children born out of the United States to U.S. citizen parents “natural born citizens” and starting with 1795 “citizens of the United States”), the only way such a child could be born not subject to any foreign power was to be born in the United States to U.S. citizen parents or to parents who had long lost any foreign nationality who at that time were American slaves and their descendents. As we can see, Congress, in all of these acts, did not make any exception for children born in the United States. It simply said that any child of any person who naturalized would fall under the act. This is broad language and included also children that were born in the United States. If Congress meant to exclude children born in the United States from having to naturalize it surely knew how to do so by using simple language. Hence, Congress considered children born on U.S. soil to alien parents to be themselves aliens. "§ 212. Citizens and natives. The citizens are the members of the civil society; bound to this society by certain duties, and subject to its authority, they equally participate in its advantages. The natives, or natural-born citizens, are those born in the country, of parents who are citizens. As the society cannot exist and perpetuate itself otherwise than by the children of the citizens, those children naturally follow the condition of their fathers, and succeed to all their rights. The society is supposed to desire this, in consequence of what it owes to its own preservation; and it is presumed, as matter of course, that each citizen, on entering into society, reserves to his children the right of becoming members of it. The country of the fathers is therefore that of the children; and these become true citizens merely by their tacit consent. We shall soon see whether, on their coming to the years of discretion, they may renounce their right, and what they owe to the society in which they were born. I say, that, in order to be of the country, it is necessary that a person be born of a father who is a citizen; for, if he is born there of a foreigner, it will be only the place of his birth, and not his country." (2) David Ramsay, A Dissertation on the Manners of Acquiring the Character and Privileges of a Citizen (1789) . He said that after July 4, 1776, birthright citizenship was preserved only for a child born to U.S. citizens. He defined the “natural born citizens” as the children born to citizen parents. Concerning the children born after the declaration of independence, he said that birthright “[c]itizenship is the inheritance of the children of those who have taken part in the late revolution; but this is confined exclusively to the children of those who were themselves citizens….” Id. at 6. He continued that “citizenship by inheritance belongs to none but the children of those Americans, who, having survived the declaration of independence, acquired that adventitious character in their own right, and transmitted it to their offspring….” Id. at 7; Finally, he said that citizenship “as a natural right, belongs to none but those who have been born of citizens since the 4th of July, 1776….” Id. at 6. (3) The Venus, 12 U.S. (8 Cranch) 253 (1814). Chief Justice John Marshall, concurring and dissenting for other reasons, cited Vattel and provided his definition of natural born citizens, and said: “Vattel, who, though not very full to this point, is more explicit and more satisfactory on it than any other whose work has fallen into my hands, says ‘The citizens are the members of the civil society; bound to this society by certain duties, and subject to its authority, they equally participate in its advantages. The natives or indigenes are those born in the country of parents who are citizens. Society not being able to subsist and to perpetuate itself but by the children of the citizens, those children naturally follow the condition of their fathers, and succeed to all their rights.’” Id. at 289. Minor did not cite Vattel but as can be seen the Court’s precedential definitions of a “citizen” and a “natural-born citizen” are taken directly out of Vattel’s The Law of Nations, Section 212. Hence, when Minor said “common-law,” it was not referring to the English common law but rather to American common law which had its basis in citizenship matters in natural law and the law of nations. Minor also distinguished between “natural-born citizens” and “citizens.” When Minor spoke of the “common-law,” it referred to the “citizens” and the “natives or natural-born citizens,” explaining that there never had been any doubts that the children born in the country to “citizens” were the “natives or natural-born citizens.” So Minor concluded that any person who was a “natural-born citizen” was necessarily also a “citizen.” The Court, was not, however, willing to say that a child born in the country to parents who were not U.S. citizens was even a “citizen” under the Fourteenth Amendment, let alone a “natural-born citizen” under Article II. The Court added that “there have been doubts” as to whether that child was even a “citizen.” Having decided that such a child was not a “natural-born citizen,” it left the question of whether such a child was a “citizen” of the United States under the Fourteenth Amendment to another day. It is important to understand that if the English common law prevailed in the United States to define national citizenship, the Court would not have stated that “there have been doubts” whether children born in the country to alien parents were citizens. Under English common law, there was no doubt that such children would have been “natural born subjects,” for under that law the citizenship of the parents was not a factor in determining subjectship when the child was born in the dominion of the King. So as we can see from this case law, and especially from the precedential definition confirmed by Minor, a “natural born Citizen” was well-defined. All other persons not falling under the well-established American “common-law” definition of a “natural born Citizen,” who wanted to be "citizens" needed a Congressional Act (positive law) to gain membership in the United States which we call naturalization. And these latter persons became so naturalized either at birth or after birth only by Congress. (6) All this continued unchanged until the U.S. Supreme Court, per Justice Horace Gray--who was appointed to the Supreme Court by President Chester Arthur whom history has recently shown was not a “natural born” Citizen (see the legal research of Attorney Leo Donofrio at http://naturalborncitizen.wordpress.com/2008/12/06/urgent-historical-breakthrough-proof-chester-arthur-concealed-he-was-a-british-subject-at-birth/ )--decided the famous case of U.S. v. Wong Kim Ark, 169 U.S. 649 (1898). The question that Minor did not answer was answered by Wong Kim Ark, in which the United States argued that a child born in the U.S. to alien parents was not a “citizen” of the United States either under the Civil Rights Act of 1866 or the Fourteenth Amendment which had been adopted in 1868. Ruling against the government, Wong Kim Ark declared a child born in the country to domiciled alien parents to be a “citizen” of the United States under the Fourteenth Amendment. Wong Kim Ark applied the Fourteenth Amendment and colonial-era English common law to determine whether a person born in the United States to domiciled alien parents was a “citizen” of the United States under that Amendment. With the Wong Kim Ark decision, even the judicial branch of government, like Lord Coke did in Calvin’s Case (1608), naturalized a person at birth. By doing so, it went beyond what as we have seen above Congress had always expressed in its naturalization statutes was a born “citizen” of the United States and expanded that "citizen" class. Indeed, Wong Kim Ark did not change the definition of an Article II “natural born Citizen.” Rather, it created another class of born "citizens," those born in the United States to one or two alien parents. Congress had never considered these children to be born “citizens” of the United States. Rather, Congress had always required that these children naturalize, either derivatively when their parents became citizens if done before the child’s age of majority or on their own if done thereafter. These born “citizens” do not meet the definition of a "natural born" Citizen but because of the Wong Kim Ark decision are nevertheless granted a birthright citizenship through naturalization at birth. By naturalizing Wong at birth, the Wong Kim Ark decision, like Congressional Acts which also naturalize children at birth, also created the anomaly that these children are born with allegiance and jurisdiction to the United States and to the nations of their alien parents (through jus sanguinis citizenship), but are not despite our citizenship history required to give an oath of sole allegiance to the United States. Hence, we now have three birthright citizenships, (1) one under Article II which gives the national status of "natural born Citizen" of the United States, (2) another under the Fourteenth Amendment, Wong Kim Ark, and 8 U.S.C. Sec. 1401(a) which gives the national status of born "citizen" of the United States to person born in the United States to one or two domiciled alien parents and “subject to the jurisdiction thereof,” and (3) another under Congressional Acts (8 U.S.C. Sec. 1401et seq.) which also gives the status of born “citizen” of the United States to children born out of the United States to one or two U.S. citizen parents. But because the Founders and Framers distinguished in Article II’s grandfather clause between “natural born” Citizens of the United States and “Citizens” of the United States (prior to the adoption of the Constitution, one could be a “Citizen” of the United States and be eligible to be President but for those born after its adoption, one had to be a “natural born” Citizen”), only a person who has Article II "natural born" Citizen status is eligible to be President. This means that only a person who was born in the United States to two U.S. citizen parents is eligible to be President. This all brings us to putative President, Barack Obama. If Obama was born in Hawaii (a fact that he has yet to conclusively prove) and if his parents are Barack Obama and Stanley Ann Dunham (it is reported that these are his parents), he can be a Fourteenth Amendment and 8 U.S.C. Section 1401(a) born “citizen” of the United States, but he cannot be an Article II “natural born Citizen” of the United States which is the constitutional standard that he must meet to be eligible to be President and Commander in Chief of the Military. 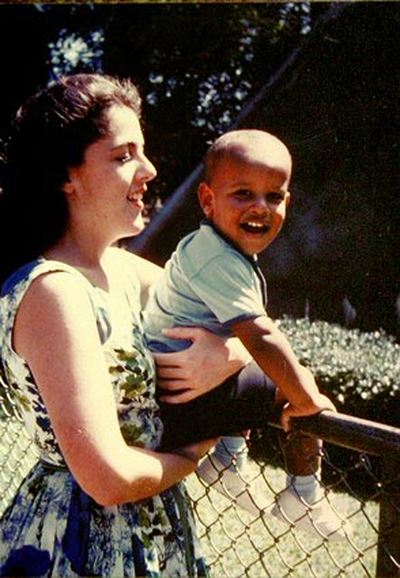 His mother, Stanley Ann Dunham, was a “citizen” of the United States at the time of Obama’s birth. But his father, being born in 1934 or 1936 in what was then the British colony of Kenya, was under the British Nationality Act of 1948, a Citizen of the United Kingdom and Colonies (“CUKC”). Obama himself by right of decent from his father under the same Act was also born a CUKC. Hence, because Obama was not born in the United States to United States citizen parents, he was not born under the sole and undivided allegiance and jurisdiction of the United States. Obama was not born with sole citizenship in the United States. Consequently, he was not born with unity of allegiance to and citizenship in the United States. Obama, therefore, cannot be an Article II “natural born Citizen” and is not eligible under Article II, Section 1, Clause 5 to be President and Commander in Chief of the Military, just as much as if he had not been at least 35 years of age or 14 years a resident of the United States.